To start, I really have to hand it to the writers of this show for incorporating so many homages to the original 2010 feature. The Rapunzel and the Great Tree special gave us a reverse incantation of the healing one from the movie for Rapunzel's magical hair, but Destinies Collide mirrored the opening voiceover monologue of the film, taking all of the dialogue of the Sun Drop and its effects on Corona and applying it to the Moonstone and the Dark Kingdom, which is Corona's opposite in every way. Just as Corona is a bright and bustling kingdom filled with colorful citizens and festivals, the Dark Kingdom is an abandoned realm without nothing to offer but bleak loneliness. The juxtapositions don't end there. We all know that Corona had a lost princess who was discovered to be our favorite magical heroine by the end of the film. It turns out that the Dark Kingdom has a lost prince, and it's someone a lot more familiar to you than you might expect. Just as Rapunzel's father tried to protect her in the first season by making the wrong decisions for the right reasons, so did the Dark King for his own son. This season has been much edgier than the first one with its bleak locales and cursed incantations. I didn't think Destinies Collide was quite as blatantly edgy as Rapunzel and the Great Tree, but with all of the contrast to the brightness and sunshine of Corona, it definitely followed the same overarching themes as the rest of the season. For me, the biggest benefit of this was the music. I tend to be a sucker for sad heartfelt songs, and this season was chock full of them. The premiere special, Beyond the Corona Walls, kicked off the second season with a bittersweet duet between Rapunzel and Eugene called "If I Could Take That Moment Back." Rapunzel and the Great Tree, which I'm considering the season's midpoint, introduced the Moonstone incantation as well as Cassandra's emotionally charged "I want" song, "Waiting in the Wings." The finale gave Eugene his own melancholy solo, "Everything I Ever Thought I Knew," which is more touching than it has any business being for a Eugene song. The Tangled fandom grew very concerned when this song was leaked prior to the airing of the finale, and for good reason. Zachary Levi's performance here is absolutely heartbreaking. 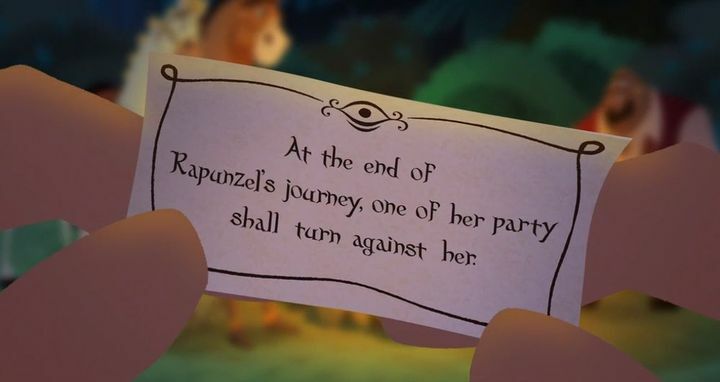 That brings us to this message that Eugene received in the last episode before the finale: "At the end of Rapunzel's journey, one of her party shall turn against her." Wasn't Shorty a traitor the whole time for stowing away in their caravan and eating all their food? Just kidding. When this episode aired, it looked like Cassandra was going to be the traitor. Before Eugene received this message, Cass had disappeared into a secret room in a haunted hotel that was full of evil clones of the main cast, and when she came back, we had no idea if it was the "real" Cassandra or not. After Eugene's tearjerker ballad got leaked, it looked like Cassandra was just a red herring and that Eugene would turn out to be the real traitor. Then we reached that irritating cliffhanger ending. It's easy to take this plot twist at face value, but the truth is that there are too many variables that we don't know about during the time Cassandra was offscreen in the "Rapunzeltopia" episode. It's possible that this version of Cassandra is the evil clone from the episode, "Mirror Mirror," but it's more likely that she learned some sort of horrible truth about the Moonstone while trapped in that secret room that we won't find out until the third season, whenever that many air. There is one thing that I am certain of, though. After reading Rapunzel and the Lost Lagoon, I will never doubt the friendship between Rapunzel and her loyal lady-in-waiting, just like I will never doubt the love between Rapunzel and Eugene. If this had been the series finale, I think it could have wrapped up Rapunzel's story quite nicely if it hadn't included the surprise twist at the end. After neutralizing the power of the Moonstone, Rapunzel would have most likely gotten her brunette hairstyle back, Eugene would know the secrets of his past, and everyone could return home to Corona to live happily ever after. However, none of that can happy yet because there is still one season left, which gives the series an opportunity to develop a happily ever after for Cassandra as well. The final season will most likely be a redemption arc for her, whether if it is to go back to the haunted hotel and recover the "real" Cassandra if this one is a clone or to learn the true intentions behind her actions. Either way, my biggest hope for the final season is that it does not get any darker than it already has. Rapunzel is a bright light in the lives of Disney Princess fans, and we can only take so much heartbreak.